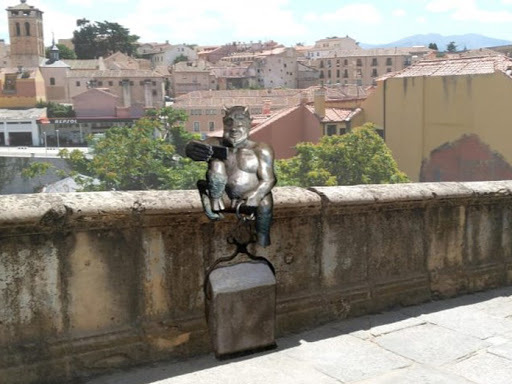 Have you wondered, what will you feel if you see a horned figure perching near a bridge, cell phone in hand, snapping a selfie? Yes, you read it right! It isn't a nightmare! It’s a real artistic proposition in the Spanish city of Segovia, northwest of Madrid, where local authorities hope a statue of Satan will become a tourist attraction. The Satanic statue is proposed to sit 200 meters from Segovia's famous Roman-era aqueduct as, the city council says, "a nod to the legend" which claims the structure was constructed by the devil himself in just a single night. But the statue's impish demeanour has upset Roman Catholics, who have collected 5,500 signatures on a petition decrying it as "offensive" to their religion. A legal complaint has also been lodged, which has reportedly been dismissed. The petitioners say the proposed devil looks too good-natured. Plus there's the whole selfie thing. "This representation is offensive to Catholics," the petition states, arguing the devil should be portrayed in art as "repulsive and despicable, not friendly and seductive." Not everyone is worried about the sculpture. A rival petition has been signed by over 2,100 people supporting against its installation. The devil sculpture, "is a part of the legend of the Aqueduct of Segovia, which doesn't affect morality or religion, since it's nothing more than a character from a legend," comprehends the appeal. José Antonio Abella, the creator of the statue, hopes the statue gets built. "It's a sad controversy for me," Abella said. "Segovia is a very beautiful city, and most of the people are friendly and calm. I fear that a few intolerant and backward people could distort the image of this city." Abella says the devil looks friendly on purpose. "I have tried to make him look nice, smiling and good-natured. But it seems that ultra-religious people do not like the demon to smile. They say it offends their religious sentiments." He told his sculptures are influenced by the work of British artist Henry Moore. Apart from working as a doctor for nearly 40 years, he is also an author. "This sculpture of the devil will be my last public statue, as I want to dedicate all my time to literature," he says. Give the devil his due; he seems to have won judicial backing. Abella says a legal bid to block the statue has failed and it should be installed by the end of January. "I believe that the sculpture will end up taking its place and that all this storm will pass," says Abella. "It has not been made to hurt anyone's feelings, quite the opposite: it is designed so that people smile at its side. "I think thousands of tourists will take a selfie with this sculpture."